Fall has finally decided to show up in Atlanta. These first few days of October have welcomed much cooler mornings and evenings than September, and students should now begin preparing themselves for the woes of the dropping temperatures. Colder weather in Georgia always seems to bring the cold virus with it. We all know that feeling. Everyone around is getting sick and we’re just waiting for it to happen to us. But is cold weather truly the culprit of head-colds? According to Smithsonian Magazine, scientists discovered that the virus usually responsible for the common cold, known as the Rhinovirus, is prone to “reproduce at temperatures just below the body’s 98.6 degrees Fahrenheit.” The study concluded that when the Rhinovirus enters cells with higher temperatures, the cells are able to identify the virus’ presence and signals are sent throughout the immune system to attack it. So ultimately, being chilly is enough for a head-cold to develop. When you’re not feeling well, your body is working overtime to heal itself and any motivation or energy that you can muster up seems like an exhausted effort. We stuff tissues in our pockets, try to stifle coughs in class and wonder ‘Why me?’, but deep down, we know that we could’ve avoided the cold altogether. Thyme: Herbal remedies in general are suggested but thyme has long been known as an expectorant, which makes coughs more productive (that is, it helps clear out your lungs faster so you feel better sooner). You can brew a thyme herbal tea by steeping two teaspoons of fresh thyme in a cup of boiling-hot water for 10 minutes. Other herbs, such as dried peppermint, chamomile or basil leaves can be brewed the same way. Honey: This sweet nectar is known to relieve sore throats and serve as an alternative solution to over the counter cough suppressants. 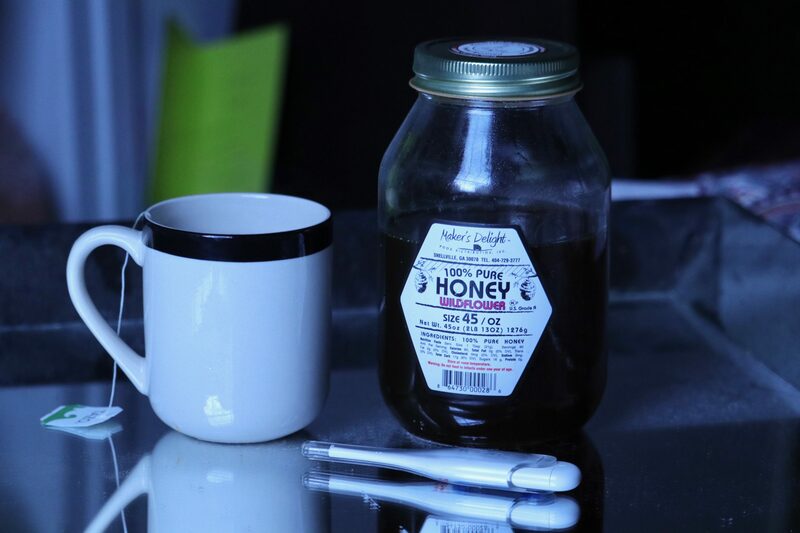 A spoonful of honey changes the game, but in order for it to work properly, the honey should be locally sourced due to the certain pollens we grow accustomed to in our environment. If you can’t swallow honey on its own, try drinking it in an herbal tea with a lemon (the acidity in lemons breaks up mucus, bonus!). Apply hot or cold packs around your congested sinuses: Either temperature may help you feel more comfortable and relieve sinus pressure. You can buy reusable hot or cold packs at a drugstore, but why not make your own! Take a damp washcloth and heat it for 55 seconds in a microwave (test the temperature first to make sure it’s not scalding). Or take a small bag of frozen peas to use as a cold pack. Sleep with an extra pillow under your head. This will help with the drainage of nasal passages. If the angle is too awkward, try placing the pillows between the mattress and the box springs to create a more gradual slope. Sleeping with a cold is difficult, but elevating your head will help you sleep through the night. To prevent the dreaded head-cold, bundle up! When you’re outside in cooler temperatures, be sure to wear a scarf or jacket and cover your face. The Smithsonian Magazine article suggests that the Rhinovirus reacts to colder temperatures, therefore when the sinus cavity, a.k.a. the nose, is colder than the rest of your body, the viruses rush in. Avoid the common cold anytime of the year by implementing a focus on your livelihood. Evaluate your daily routines and ask yourself what areas you need to focus or improve on. When you prioritize healthy choices and find what works best for you, there’s a clear difference that’s sure to have you feelin’ good.